You grew up in Scioto County?So did I. I lived in Portsmouth. I just finished reading The Measure of Katie Calloway, which I really enjoyed. I noticed in your author bio that you live on a farm in southern Ohio near an Amish community. Could that by chance be in Adams County, Wheat Ridge? I was just down there two weeks ago visiting my cousin who lives on a farm near West Union and we always go to Miller’s and Keim’s stores to look around and buy baked goods. Glad to hear of a Scioto County person being so successful especially a writer, a talent I admire, since I’m a retired English teacher. Great to hear from a former Portsmouth native! I grew up in Minford and still live there. The Amish community I live near is the one in Oak Hill which is about twenty minutes away. We are pleased that it is growing rapidly. The last I heard they had four settlements in that area now. Wheat Ridge is an interesting place, although much further away. Such a precious photo! And precious memories to go with it. I was so thrilled to find it. 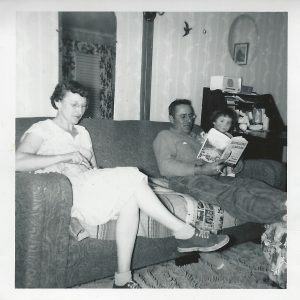 One of my favorite memories was sitting on my dad’s lap as he read to me.